Our Vape Shopping Guides for 2019 feature the best vape mods, tanks and vape juice available. Now that vaping has become a mainstream phenomenon, new vapers can be easily overwhelmed by the sheer number of e-liquid choices available. Not only do you have to choose what type of device you want to use, you also have to decide on the best liquid that you will enjoy vaping. Here at DIRECTVAPOR, we have hundreds of popular flavors from some of the biggest brands in the industry, and this guide is designed to help you narrow down your search to something a little easier to take in. Let's break things down by demographic a little bit to help you find your vaping groove. The DRAG 2's impressive power and speed along with its GENE.FIT chipset make this vape mod kit a MUST have for 2019! Available in a variety of gorgeous resin designs, this kit looks just as good as it performs! Stealthy and sleek, this pod is taking the industry by storm! Its gradual ramp up and multiple coil options make this optimal for any level of vaper looking for that perfect ultra-portable vape pod system! Being one of the most trusted brand's for e-liquid, it's no wonder Naked 100 makes it to the top our of list for best vape products of 2019! Plus, this refreshingly delicious e-liquid never gets old! Cloud production, flavor, value.. this juice has it all! If you need a mod that can withstand anything you throw its way, then you definitely need this vape mod. Plus the fact that it can fire up to 200W makes it perfect for any sort of high wattage vaper looking for a mod that can keep up! With a ton of different options and coil resistances, these are our #1 top selling replacement vape coils, and it's no surprise why! 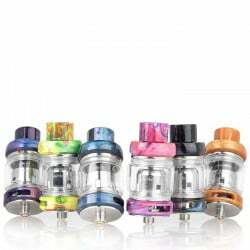 One option to definitely consider for these is the TFV12 Decouple Head which provides 0.11 ohms of resistance and can be fired between 60-120W, which is the sweet spot for most vapers. Mesh has become a popular trend in vaping, and for good reason! Mesh coil tanks provide better flavor and cloud production than traditional coils. The FreeMax Mesh Pro Tank, top-filling tank not only utilizes this amazing technology while also providing a leak-proof intelligent design! For all those pod vapers out there looking for flavor and quality, here's the juice for you! Naked 100 always brings their A-game and it's no different with their 30mL bottles of nicotine salt e-liquid. We picked this one because the flavor and throat hit are just perfect! Plus, the value can't be beat! A stunning collab between Mr.JustRight1 and Wotofo, this RDA employs an advanced mesh build deck, spring-loaded ceramic cotton support system, and beehive style top cap airflow to perform like an absolute beast! If you're a builder, you should definitely have this in your arsenal! Now that vaping has become a mainstream phenomenon, new vapers can be easily overwhelmed by the sheer number of e-liquid choices available. Not only do you have to choose what type of device you want to use, you also have to decide on the best liquid that you will enjoy vaping. With hundreds of brands in the vapor game these days, it can be hard to decide on just one to start with. This is a quick preview of some of the best brands on the roster today. You can read more about each brand below. VaporFi -VaporFi is credited with having more than 30,000 flavor combinations available through their website. If you're looking for variety, this is the place to go. Naked 100 - The quality of Naked 100 cannot be overstated and the experience in vaping from one bottle to the next just what you’re looking in fruit favored e-juices. Naked 100 is acomprehensive line of liquids that satisfies every need in every category of vaping and does so in the form expect from a premium e-juice brand. Mad Hatter-Their dedication to using only the finest flavor extracts produces a premium quality e-liquid you will hard to put down. Mad Hatter utilizes the finest USP grade ingredients, giving excellent flavor in the maximum VG based e-liquid. Motley Brew One Hit Wonder- Each and every one of their flavors stands out from the rest, covering the whole spectrum of popular vape categories, including breakfast foods, desserts, pastries, beverages and more. Juice Roll Upz - This may be a strange addition to this list, but this unique brand has really made an impact on the scene for those who love crazy candy flavors. They have also earned a pretty good reputation with menthol lovers. Aside from these five big players, there are a number of smaller brands that have also made it into our Best Of list. As you read on, you will find our favorites showcased according to the category that they best fall into. By and large, many vapers come to vaping as a means of leaving behind cigarettes. For ex-smokers learning to vape, the choice of a great e-liquid is often imperative to sticking with the new habit. A poor flavor the first time around can discourage smokers from wanting to vape full-time. Most notably, ex-smokers tend to stick with traditional tobacco and menthol flavors rather than branching out into the wider world of candy and dessert flavors. VaporFi has taken home plenty of awards with their flavors, but they are one of the few companies that have introduced multiple versions of their tobacco liquids and menthol liquids. They have created tobacco flavors that cover the wide spectrum of traditional options offered by red and Havana Beach. On the menthol side of things, they have also added a number of mentholtwist options, including Grnd Rsrv Maui Menthol, and lighter minty varieties. VaporFi also deserves a shout out for having the best flavors overall for ex-smokers. The Tobacconist by Element -deserves a mention here as well. This entire brand has built their identity upon quality tobacco-flavored vapes. They have some interesting recipes, but they have also mastered the authenticity of the tobacco flavor and hit that you're looking for. Kings Crest By working long hours and using the best ingredients available in order, Kings Crest has sought to create a series of flavors that would take the vaping world by storm. The result of all the hard work was “Kings Crest”, a mouthwatering line of E-liquid with complex flavors and rich undertones. On the menthol side of things, Juice Roll Upz has taken these icy cool vapes in a whole new direction.Feel free to peruse our blog as you search for your best tobacco vaping experience. When it comes to cloud chasing, your choice is far more about the chemical content of the liquid than the flavor itself. Nevertheless, there are plenty of fantastic flavors in this category, so you shouldn't let that deter you. In fact, manufacturers have learned by now that if you're going to be vaping competitively you need a really smooth flavor that won't irritate your throat or cause you to get burnt out. Right off the bat, we'd like to introduce you to some of the best e-liquid brands for cloud chasing. You're searching for liquids that come with very high VG options to produce those thick clouds. While 70 percentVG has become a new standard within the industry, there are only a handful of companies that have gone beyond this mark into the max-VG range for vapor production. Beard -The most prevalent among them is Beard Vape. These incredible flavors come in many varieties, and their unusual numbering system gives you a taste of mystery every time you try one. After all, what is a No.51? You just have to unwrap it to discover the intense custard filling inside. Far by Element -In terms of best flavors overall, we'll give it to Element with their Far series and their regular lineup of flavors. They've been around for a while and people give them rave reviews. With flavors like Candy Punch you'll really enjoy every cloud you blow. In the unique flavors category, Vape Breakfast Classics haveearned themselves quite the cult following these days. If you're really into breakfast foods, these may be the liquids for you. French Dude is a true French toast replica that you just might fall in love with. The Tobacconist still makes a strong showing in this category with a variety of tobacco-flavored liquids for those who don't want something too fruity while they're cloud chasing. Their Roasted Honey Tobacco is a nice, mellow choice all around. Choosing proper e-liquids for herb lovers can be a challenge. Herbal flavors are known for being more subtle and complex. While many e-liquid manufacturers have dove head first into bright fruity flavors and wild desserts, you need to find brands or even vape flavors that specialize in relaxing options. Here at DIRECTVAPOR, we find that the most popular flavors in this category are the ones with rich spices. Thus, we'd like to introduce you to some fabulous concoctions that were put together through a joint effort by VaporFi and Cosmic Fog. Grandma's Dutch Apple Pie is a whirlwind of cinnamon and other spices perfectly blended into a vape juice. King's Crest is also known for their distinctive line of dessert vapes featuring very complex spices and flavors. They may be a little sweet for some people, but they definitely don't lack depth. Try Strawberry Duchess on for size and see if you can pick out all of the flavors on your own. Obviously, any of The Tobacconist's great tobacco flavors also havea wealth of earthy herbal tones for you to love. Let's face it, 90s kids were raised in an insane generation of technological advancement and rapid changes. They have seen their childhood fall away into the distance perhaps faster than any generation before them. We can't help but empathize with their desire to take things back and relive the joys of their childhood once more. The good news is that there are several iconic flavors that are just right for doing so. VaporFi and Cosmic Fog have come together to offer two fantastic ’90sflavors that you will want to get your hands on. Their Vanilla Caramel Bites are reminiscent of your favorite movie theater treats. Meanwhile, the Strawberry Shortcake Ice Cream flavor will take you back to all those times you chased the ice cream truck down the street as a kid.We have to give it to VaporFi and Cosmic Fog for creating some of the most flavorful e-juice options in this categoryand for recognizing the need for these classics. After all, there is no shame in enjoying some of theflavors from your childhood that make you smile. Policeman by One Hit Wonder is another stellar example featuring your favorite cereal. Marshmallows and sweet sugary cereal bites come together in a blissful way. ADE -While we're here, we should also mention another distinctive brand that has made its way to the top: ADE. Youknow, those delicious sports drinks that are supposed to give you back everything you need to be a competitor? You can now enjoy Purple Ade, Red Ade and Blue Ade anywhere you go in vapor form. While we're on the subject of beverage vapes, there are also some fantastic slushie vapes that will jog your memory of hot summers as a kid. You definitely don't want to miss out on that. If you're all about layering on the flavors and taking your taste buds on a joy ride, you're in luck. A few brands have really stepped up to the plate and taken on the challenge of creating flavors that will blow your mind with their complexity and authenticity. Two particular brands come to mind in this category: King's Crest and VaporFi Grand Reserve. However, there are plenty of others worth a mention. King's Crest -The team at King's Crest has gone above and beyond to create some of the most indulgent dessert flavors you will find anywhere in the vapor industry. They are renowned for their spices and perfect balance. It's almost as if they sought out some of the most difficult dessert dishes to make, and then got right down to the business of replicating them in vapor form. Their award-winning Strawberry DuchessReserve is just one example of how perfectly a tres leches cake can be created out of vapor alone. This flavor was so successful that they ended up improving upon it in their Reserve line, and then adding a Strawberry version as well. Rest assured, this certainly isn't their only flavor worth trying. VaporFi -VaporFi has introduced Raspberry Mocha and Catch Ya Latte, both of which are exemplary. These two coffee-inspired e-liquids are suitable for anyone who considers themselves a connoisseur of fine coffee. Grandma's Dutch Apple Pie also deserves a mention here for distinguished flavors. Honorable Mentions -If you're looking for something a little further off the beaten path, we really recommend trying the Blueberry Funnel Cake by Famous Fair. This is sort of a seasonal delight that is well worth the trouble. How else could you enjoy rich funnel cakes year round? At the end of a long day, sometimes all you want is to kick back and have a drink. Now you can with these incredible vapes. Sure, there are some great coffee vapes out there, but VaporFi have also stepped up with some incredible mixed drink options. Most notably, VaporFi's Raspberry Mocha is a perfect example of what a mocha should taste like in your hand. By looking at VaporFi under the e-liquids navigation on the site, you will find fruity mixed drinks of all kinds. Of course, VaporFi is well known for having some of the best vape juice in the industry thanks to their huge selection of mixes. Candy, candy everywhere! There are seriously so many incredible candy vapes on the market today, it's almost impossible to narrow this category down. For whatever reason, vapor manufacturers discovered the sweet spot with candy vapes and they have endeavored to recreate every candy we have ever loved as a child, including creating some fascinating combinations that you know we all wanted to try when we were younger. 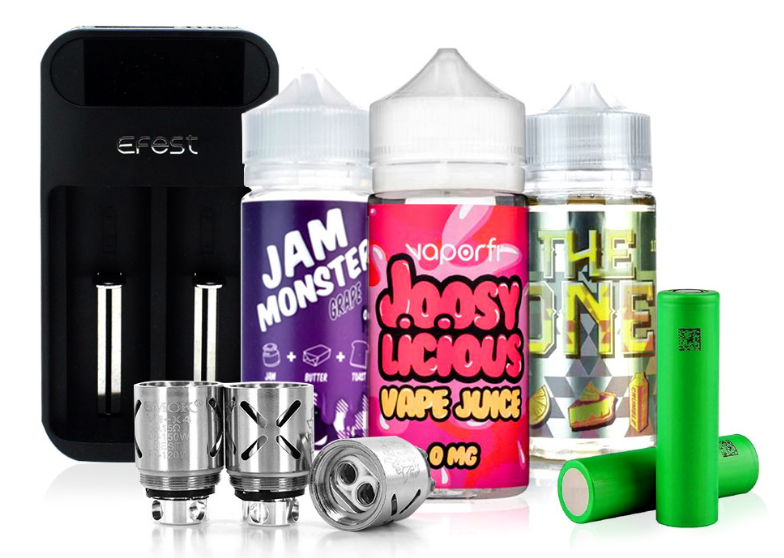 The two standout brands in this category are Juice Roll Upz and Chubby Bubble Vapes. They have both created some of the most popularcandy flavors known to man. Juice Roll Upz offers fruity candy roll-ups in green apple, watermelon, strawberry and an odd orange-cherry flavor. Meanwhile, Chubby Bubble Vapes offers a few tasty gum flavors like melon, blue raspberry, grape and fruit punch. The accuracy of these flavors is almost too good to be true. Naked has also made a few stellar entries here with their sour and sweet chewy candies, and you definitely won't want to miss One Hit Wonder's Magic Man, which is a fantastic gummy bear rendition. We'd like to thank these brilliant minds for giving us all the candy we can get our hands on, guilt-free. We know you just can't help yourself when you get around a tray of fresh warm cookies. The good news is that there are some standout entries in this category as well. Yes, we talked earlier about some of the popular desserts flavors in the Foodie category, but let's take a moment to appreciate some really special cookie and dessert vapes here. I LOVE... -It would feel wrong if we didn't start out with I Love Cookies Too. This perfect sugar cookie vape is to die for. If you're really a cookie monster, you'll have a hard time resisting this flavor. Of course, these guys couldn't help themselves either, so they went ahead and created I Love Donuts and a number of other flavors that perfectly round out the baked goods category. Nilla Vapers also made a strong showing with their traditional vanilla wafer and strawberry wafer flavors. Wafers tend to be mellower in flavor, which is nicely laid out in these liquids. Quiet Owl has anunusual Late Night flavor. This after-dinner treat is the best way to settle down in the evenings with ice cream, caramel, and chopped nuts. Bam Bam's Cannoli takes us around the world to enjoy an international favorite with a variety of different cannoli takes that will keep your mouth watering. Did you even know that a cannoli could be dipped in fruity pebbles? We didn't either until now! If you've been searching for a totally unique flavor to run with, this cannoli is worth your while. Hopefully, this guide has given you some insight into what makes a vapor flavor a best seller. We know that we couldn't possibly nominate just one flavor to be best for everybody, so we had to drill down and determine what each type of vaper is really looking for. You can of course check out our Best E-Liquids of 2018 nominations for additional insights into the world of incredible vape flavors. The good news is that we were able to identify some really incredible brands and flavors in each category. Don't forget that DIRECTVAPOR is home to the largest selection of e-liquid products from all over the world. We also back all of these products with our Low Price Guarantee.